Throughout the Millennium series thus far, Aldorlea Games has managed to capture and hold my desire to continue playing through each episode, all the while introducing the deep, impactful themes of hope, despair, courage, and willpower. 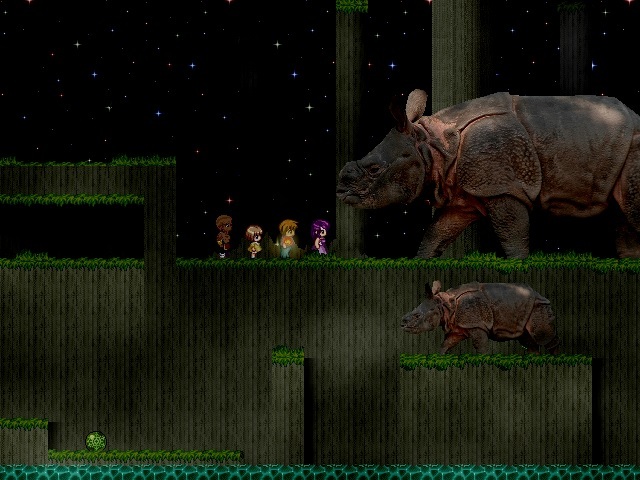 We have followed the unfolding saga of Marine, a teenage girl from a poor rural village, dare to stand against a tyrannical kingdom and its implied societal norms. Millennium 4 – Beyond Sunset continues this epic tale as Marine and her band seek out final companions for a showdown that will change the course of history. 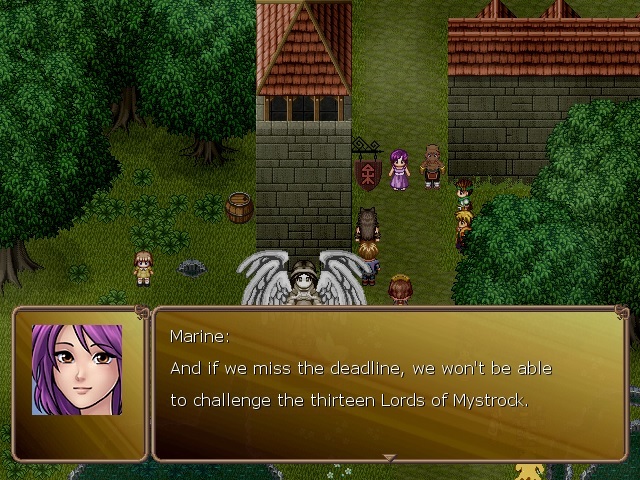 The encompassing plot, in which Marine seeks 13 warriors throughout Mystrock to enact the Martial Law, a means to challenge and possibly usurp the current ruling government, is approaching its climax. Marine sets off to find four final members as the deadline to register her team draws ever closer. Throughout the game, Millennium 4 emphasizes this aspect of dwindling time and the anxiety it can induce. Sarcasm, resignation, and hopelessness ensue and play a major role in dictating the tones and overall mood of this episode. It can get a bit grating at times, but paired with Marine’s strong personality, they both play nicely with one another and assert the push and pull of determination versus potential failure. What I found especially noteworthy is the palpable feeling of a time limit imparted to players. It’s impressively executed, as I noticed my moods changing as the game progresses and catching myself with the desire to play faster for Marine’s sake. Even though playing fast or slow doesn’t make any difference, it’s a level of immersion that’s unexpected, making it all the more profound. The plot itself, however, isn’t all that remarkable. The series has followed a formula of driving plot through Marine’s desire to help individuals. Here, the plot, and the rest of the game, take a far more linear approach. This episode is basically one long trek from point A to B and back to A. While there is plenty of adventure, danger and character interaction to enjoy, the storyline itself is lacking depth. It’s noticeable enough for me to comment on it, but the story has enough to carry me into the approaching final chapter. Previously with Millennium 3, I had opined that reoccurring characters and their development were no longer a priority to the writers, as I felt they were more interested in moving on to the next new batch of characters. In Millennium 4, I’m finding myself disappointed that even the newest additions do not receive substantial development. Of the four new allies joining, only The Bear is shown any real attention, yet his personality fits a mold of dejected, hardened warrior that eventually softens and comes around. Wolfgang and Suzuki, another pair of newcomers, get a few lines here and there, but that’s it. 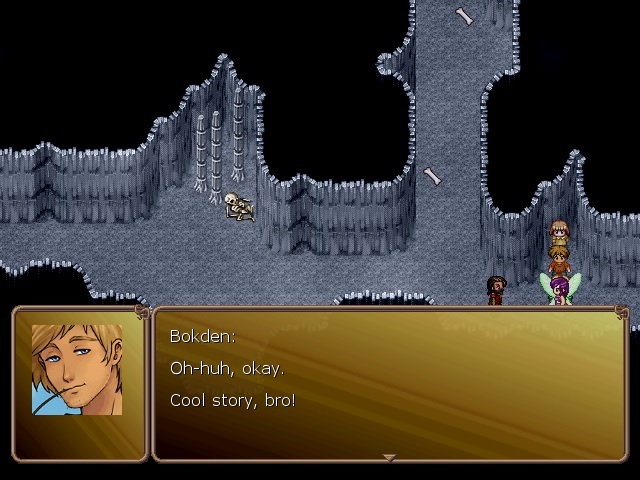 And Bokden, who was previously a recurring character for subquests, receives just enough development to distinguish him as a more competent, less jokester version of Jack or James. Where I had thought the newcomers would at least elicit the same level of development as the rest of the supporting cast during their debuts, I feel they have even less than that. Despite all of this, what we do see is significant depth in the form of Marine’s personality reaching new levels. We are now seeing Marine’s fatigue, stress, and mounting burdens getting the better of her to the point that the battle between her determination and hopelessness is at its peak. Through this, we get to view some very lively scenes where Marine’s resolve and stubbornness start blending and become indistinguishable. Also, moments where she continues to hold out hope are far more poignant with this internal struggle and I couldn’t help feeling far more happy for her and feeling honest relief when something does go her way. We also see her teenage volatility on display, as, again, that stubbornness and impassioned rage replace the jovial, almost carefree traits she had at the start of this saga. Young hope, teenage tenacity, and bursting, overflowing emotions all boil over and pour out of her and the results are absolutely wonderful. It conveys the evolution of this character; maybe it’s not the most ideal or model way for a teenager to grow, but given the circumstances surrounding her, it makes Marine all the more real, relatable, and lovable. 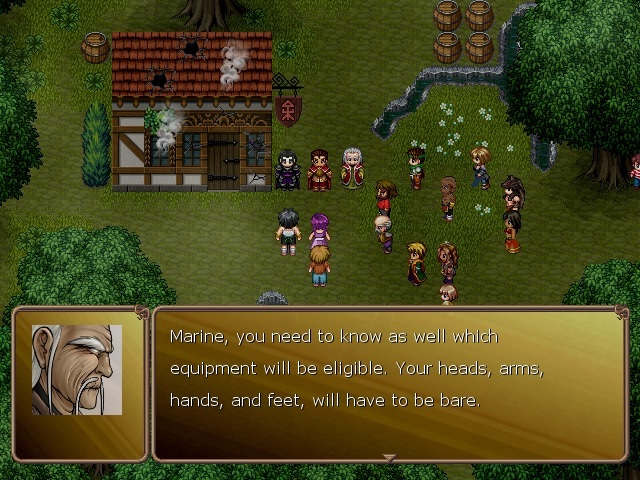 Despite the shortcomings of secondary character development, Marine’s depth and growth are definitely worth experiencing. This unevenness in quality, which affects the narrative and characters, is also an issue with gameplay. 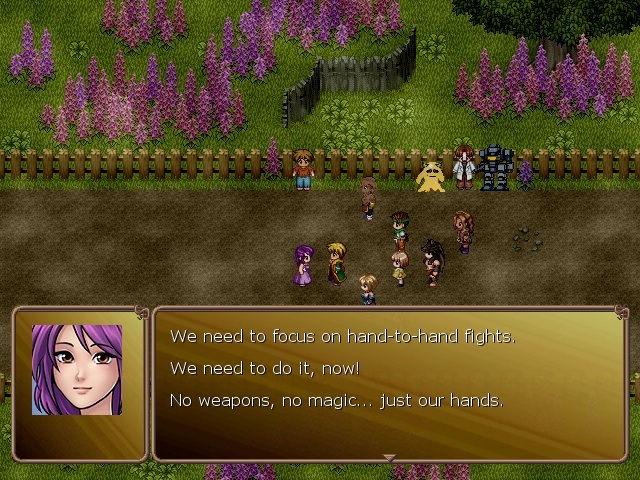 Starting with combat, Millennium 4 alters the turn-based system slightly to be in line with the tournament rules, meaning that no weapons or magic spells can be used by our heroes. So instead of equipping new weapons, everyone uses Hand Skills that can be leveled through hit count. Since a character’s attack power is now dependent on how many hits they accumulate throughout the game, it allows for some strategy and preference. Deciding who to use in your active party and when, as well as who equips special items that allow for multiple hits in a single turn, add some much needed variety that the combat mechanic has been lacking. Jeanne the fairy makes a return and can be summoned to support your party, plus she’ll automatically show up when ambushed. Outside of combat, options for visible enemies and quest markers are back as well, and are still much appreciated. The promotion system also returns and sees improvement. A double-promotion is possible for all characters, which are dependent on their first promotion or class change. My previous complaints with promotions, in that there is zero information regarding how the promotions will affect characters’ stats, has been partially addressed. Here, details on each double-promotion class is provided, so decisions are no longer complete guesses. Finally, there are no major bugs that hamper play, so Aldorlea is back on track in terms of build quality. More information, more variety, and keeping what’s worked previously all help to maintain an expected gameplay quality. Unfortunately, gameplay isn’t perfect, so much so that I feel Millennium 4 has some of the most outstanding flaws thus far. The major drawback I find this game suffers from is its forced linearity. Simply put, things are way more missable in this game. Without prior knowledge of what subquests to start, which secrets need to be collected, or what paths are safe to take, you’ll most likely end up missing out on something. Rather than rewarding inquisitive players who are willing to explore and discover, they are punished with the possibility of lockouts and points of no return. Even worse, some secrets or quests only have a single time to find or finish before they are blocked. Also, several quests are dependent on one another, meaning if you’ve failed to initiate or progress one quest, it will disable your chances of completing others. You are essentially forced to do things right the first time or you’ll miss out. RPGs are meant to inspire curiosity and adventure, so this decision to incorporate lockout points is incredibly frustrating. This was a non-issue in Millennium 1 and 2, both of which encouraged exploration, and hardly a concern in 3, albeit with its own few lockout points. Now there are substantial consequences if you explore the wrong areas first or progress too quickly. Other issues I found frustrating are with the game’s achievements. The Steam version includes some awful achievements that must be completed at specific times, lest you get locked out and miss your chance. For example, you only have The Bear in your party for a limited time, but one achievement is for him to reach 1000 kills. He’s not the only one, as Bokden also has this terrible achievement. Lazy and unnecessary achievements like this force you to grind before a lockout, resulting in nothing but a screeching halt to play flow and a dishonest way to extend playtime. In these instances, I find the Aldorlea version of the game superior, as there are no mindless achievements for completionists to stress over. Finally, the point-and-click mechanic has taken a step backwards, as it resembles its Millennium 2 form. 1 and 3 utilized icon changes as you mouse over Secret Rooms. This was removed in 2 and now again in 4. What’s worse, while 2 made good use of visual cues to hint at secrets, 4 is lacking in this. While some secrets and Secret Rooms have visual cues in the forms of suspicious sprites and pattern changes, they are fewer here than in 2. Once again, I can’t help but think Aldorlea is trying to drive up guide sales. Narrative and gameplay are not flawless and, sadly, the aesthetics of Millennium 4 also have their faults. I will start by saying Millennium 4 looks beautiful and sounds terrific. A lot of love has been poured into the aesthetics of the entire series and this game is no exception. Even in its fourth iteration, it’s still a pleasure to experience. However, I can’t help but think corners have been cut. For one, Marine’s new portrait art is not nearly as refined as the portrait art used in 1-3. The plot driven change in her appearance in 2 was as equally stunning as her original artwork. This newest art lacks the charisma and vividness seen previously. Speaking of portrait art, the artworks for some characters, for example The Bear, is disproportionate and looks out of place. This is most noticeable during battles, as the scale of the artwork, as well as his pose, clash with how the other characters are portrayed. I realize The Bear is a tall, brawny guy compared to everyone else, but his depiction could have better matched the style of the other portraits. Aldorlea had no problems depicting the smaller scales of Dee and Merline, so why this happened, I believe, can only be explained as apathy on the part of the artists. Finally, the character introductions, profile pictures and descriptions of new characters that appear at the beginning of 2 and 3, are completely absent here. I enjoyed reacquainting myself with the cast at the start, so their omission is unfortunate. Overall, these decisions are regrettable; I’ve come to expect the same superior quality Aldorlea previously implemented. I expected a stronger effort than what Millennium 4 provides. Its flaws are noticeable and its level of polish has dropped in comparison. Having said that, this game does many things right and has its moments of brilliance. Charm, immersion, and an impressive level of emotional depth all help to bolster the game’s pros over its cons. 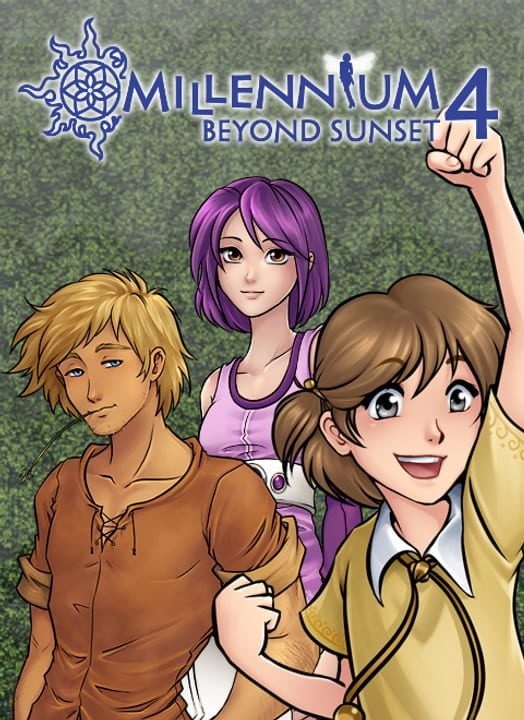 While it may not outshine its predecessors, Millennium 4 still manages to hold its own and I would definitely call it a worthy addition to the series.